I have finally finished my exams woooo! While I was meant to be revising for them at the start of the week I ended up procrastinating sooo much by cooking and ended up making roasted red pepper hummus, red cabbage slaw and some incredible different things out of cauliflower. All of them were pretty simple to make and were the perfect distraction for revision but my favourite had to be the cauliflower… As I was cutting it up to roast I realised that I was about to chuck all the leaves away and what a waste?! So I decided to see what they would be like roasted as well and ohhhh my it was delicious. 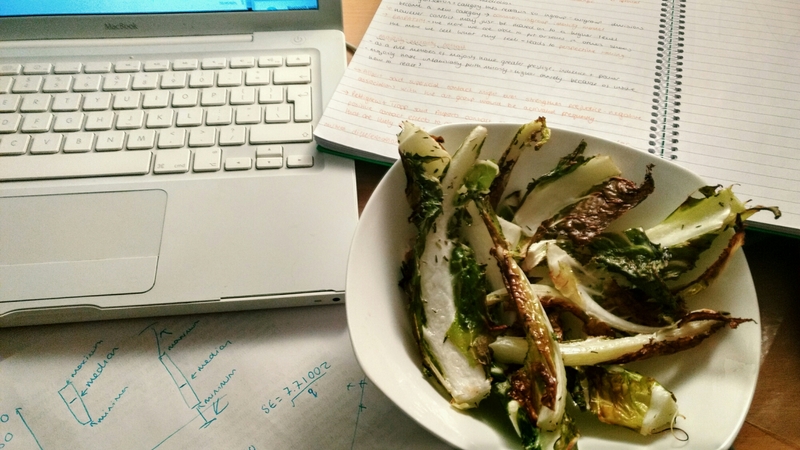 Roasted Cauliflower with leaves- the perfect revision snack. 2). Generously cover the florets and leaves with oil, thyme and garlic. 3). Put onto a baking tray and put into oven at 180 for around 40 minutes. 4). Once slightly browned remove from oven and serve whilst hot! 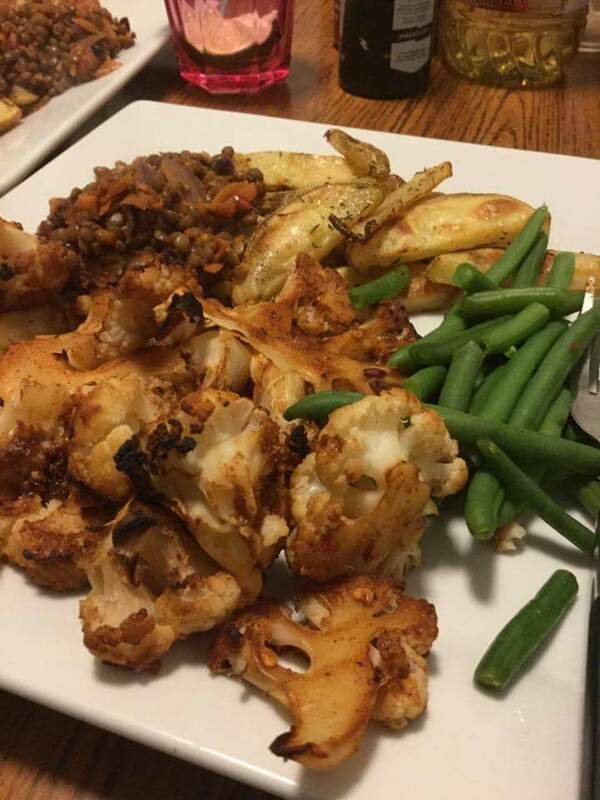 Later that week I saw a video on Facebook of a Jamaicany spiced roasted cauliflower steaks, so that day went to the shop and bought another cauliflower and tried it that evening. It. Was. Amazing. I used my flat mates jerk seasoning, added in cumin, paprika, cayenne and garlic powder. Mixed that in with ketchup and water and covered the ‘steaks’ in it and roasted them for 45 minutes. Why did people ever boil cauliflower instead of roasting it?! Yuck! That’s my memory of cauliflower too- smelly and floppy. Why were they ever boiled when they’re so delicious roasted! Only meat and potatoes got roasted, women learned from their mothers or were taught at school and everyhing was boiled. What a great Idea! 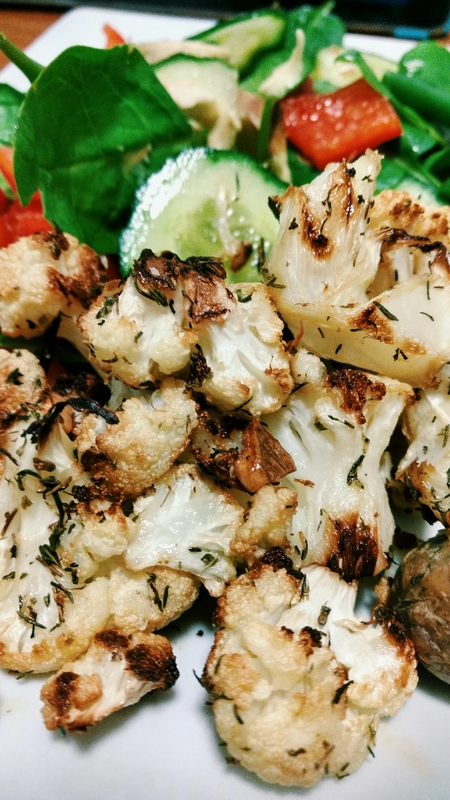 I love roasting cauliflower alone or with other veggies. Will definitely have to try it with leaves. I”m currently obsessed with cauliflower! I’ll try it! Thanks!